Casper, who 12 years old, boards the No3 service at 10.55am from outside his home in Plymouth, Devon, England, and travels the entire 11-mile route before returning home about an hour later. On the route, the cat passes an historic dockyard and naval base, a city centre, several suburbs and the city's red light district. 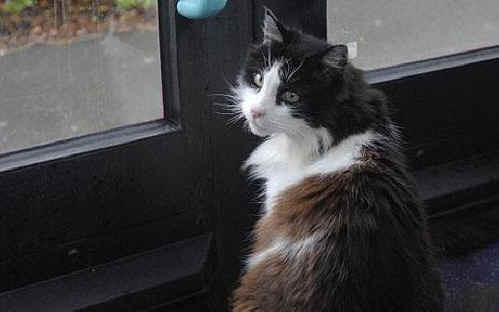 Susan Finden, 65, a care worker who is Casper's guardian, said: "Casper has always disappeared for hours at a time but I never understood where he was going. "I called him Casper because he had a habit of vanishing like a ghost. But then some of the drivers told me he had been catching the bus. "I couldn't believe it at first, but it explains a lot. He loves people and we have a bus stop right outside our house so that must be how he got started - just following everyone on. "I used to catch the odd bus too so maybe he saw me and got curious what I was doing. "Casper is quite quick for his age so he just hops on to the bus before the doors close. He catches the 10.55am service and likes to sit on the back seat." Rob Stonehouse, one of the drivers on the route, said: "He usually just curls up at the back of the bus. Sometimes he nips between people's legs but he never causes any trouble." Casper has traveled an estimated 20,000 miles but Mrs. Finden says because he is getting old the drivers often have to shuffle him off at the right stop.